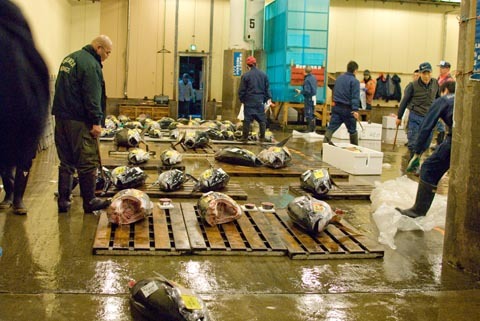 Tokyo’s famed Tsukiji Central Wholesale Market, the center of the world’s seafood trade, has closed the famed tuna auctions to tourists until May 8th (see the story in Mainichi Daily News). Although the market has closed the auctions to tourists during the busy New Year’s season, this is the first time that they have been closed outside of that time period. It’s too bad, but on my last visit I did notice that the long lines of (slightly clueless) tourists were in the way and some of the workers at the market seemed frustrated with their mere presence. 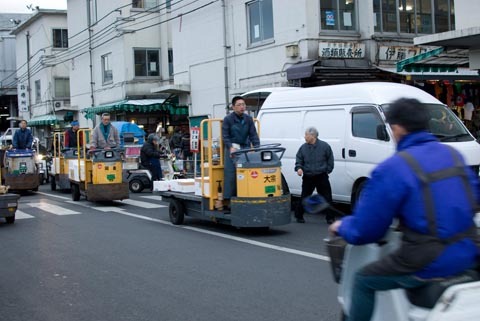 Of course, this doesn’t mean that the market is completely closed–you can still enjoy a delicious sushi breakfast in the outer market and peruse the shops there. Once the auctions reopen, if you go, stay out of the way of ongoing business, look out for those turret trucks, and don’t touch the fish!